The playing surface is a lane, 60 feet long from the foul line to the head pin 42 inches wide. On either side of the lane are gutters; if the ball goes off the edge of the lane, it will drop into the gutter and be carried past the pins. The approach is an area 15 feet long, ending at the foul line. The bowler, in making the approach, must not step over the line; 60 feet beyond it is the headpin. The pins are arranged in four rows, with one pin in the first row, two in the second, three in the third, and four in the fourth. They are numbered 1-10; the pins themselves don't carry specific numbers, but the spots on which they are placed do. The regulation pin is made of hard maple; it is 15 inches high and has a diameter of 2 ¼ inches at the base and a circumference of 15 inches at its widest point. Weight must be between 3 pounds, 6 ounces and 3 pounds, 10 ounces. The regulation ball is of solid composition, has a circumference of no more than 27 inches, and weighs 10 to 16 pounds. A ball may have two or three finger holes; most bowlers use the three-holed ball, inserting the two middle fingers and the thumb into the holes. Bowling in ordinary shoes isn't permitted, because it can damage the lanes. The peculiarities of the sport demand an unmatched pair of shoes. The right-handed bowler wears a left shoe with a relatively slippery sole, usually of hard leather or vinyl, and a right shoe with a rubber sole that will help "brake." A game is made up of 10 frames. Each frame represents one turn for the bowler, and in each turn the player is allowed to roll the ball twice. If the player knocks down all the pins with the first roll, it is a strike; if not, a second roll at the pins still standing is attempted. If all the pins are knocked down with two balls, it is a spare; if any pins are left standing, it is an "open frame." If a bowler commits a foul, by stepping over the foul line during delivery, it counts as a shot, and any pins knocked down are re-spotted without counting. 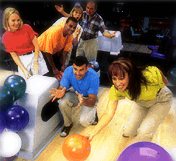 If pins are knocked down by a ball that has entered the gutter, or by a ball bouncing off the rear cushion, they do not count, and are re-spotted. In an open frame, a bowler simply gets credit for the number of pins knocked down. In the case of a spare, a slash mark is recorded in a small square in the upper right-hand corner of that frame on the score sheet, and no score is entered until the first ball of the next frame is rolled. Then credit is given for 10 plus the number of pins knocked down with that next ball. For example, a player rolls a spare in the first frame; with the first ball of the second frame, the player knocks down seven pins. The first frame, then, gets 17 points. If two of the remaining three pins get knocked down, 9 pins are added, for a total of 26 in the second frame. If a bowler gets a strike, it is recorded with an X in the small square, the score being 10 plus the total number of pins knocked down in the next two rolls. Thus, the bowler who rolls three strikes in a row in the first three frames gets credit for 30 points in the first frame. Bowling's perfect score, a 300 game, represents 12 strikes in a row--a total of 120 pins knocked down. Why 12 strikes, instead of 10? Because, if a bowler gets a strike in the last frame, the score for that frame can't be recorded before rolling twice more. Similarly, if a bowler rolls a spare in the last frame, one more roll is required before the final score can be tallied. Wait for the bowler to your right to deliver his/her ball if you're both bowling at about the same time. Remain behind your fellow bowler while he/she is bowling. Confine your bowling to your own lane. Observe the foul line, even in casual play. Play fair. Never bowl in street shoes. Avoid using someone else's ball without permission. Limit swearing and bad language as much as possible. Be ready when it's your turn. Bowing has been popular with millions of people for thousands of years. Bowling balls and pins were found in the tomb of an Egyptian king who died in 5,200 B.C. The ancient Polynesians bowled on lanes that were 60 feet long, the same as today. Bowling was part of a religious ceremony in fourth century Germany. Those who could knock down the pins were said to be of good character. Those who missed had to do penance. Even Martin Luther was a bowler. British kings Edward II and Richard II banned bowling because they said people were wasting too much time playing the sport. But Sir Francis Drake played a game of bowls before he went to war against the Spanish Armada. Bowling has been popular in America since Colonial days. The British imported lawn bowling but German settlers introduced ninepins, the ancient game that evolved into today's modern tenpin sport. Because of confusion over playing standards, the top bowlers of the 19th century decided that the sport needed a standard set of rules. They started the American Bowling Congress in 1895 (now the United States Bowling Congress). The Women's International Bowling Congress was started in 1916.